The best, most modernised French armies had been sent north and lost in the resulting encirclement; the French had lost their best heavy weaponry and their best armored formations. 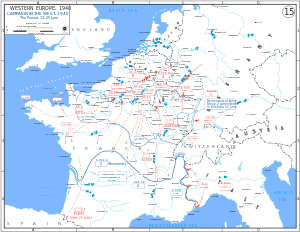 Between May and June, French forces were in general retreat and Germany threatened to occupy Paris. The French government was forced to relocate to Bordeaux on 10 June to avoid capture and declared Paris to be an open city the same day. Adolf Hitler had a number of reasons for agreeing to an armistice. He wanted to ensure that France did not continue to fight from North Africa, and he wanted to ensure that the French Navy was taken out of the war. In addition, leaving a French government in place would relieve Germany of the considerable burden of administering French territory, particularly as he turned his attentions towards Britain. Finally, as Germany lacked a navy sufficient to occupy France's overseas territories, Hitler's only practical recourse to deny the British use of them, was to maintain a formally independent and neutral French rump state. According to William Shirer's book Rise and Fall of the Third Reich, French General Charles Huntziger complained that the armistice terms imposed on France were harsher than those imposed on Germany in 1918. They provided for German occupation of three-fifths of France north and west of a line through Geneva, Tours and the Spanish border so as to give Nazi Germany's Kriegsmarine access to all French Channel and Atlantic ports. All persons who had been granted political asylum had to be surrendered and all occupation costs had to be borne by France, to the tune of 400 million French francs a day. A minimal French Army would be permitted. As one of Hitler's few concessions, the French Navy was to be disarmed but not surrendered, for Hitler realized that pushing France too far could result in France fighting on from the French colonial empire. An unoccupied region in the south, the Zone libre, was left relatively free to be governed by a rump French administration based in Vichy, which also administered the occupied zones, albeit under severe restrictions. This was envisaged to last until a final peace treaty would be negotiated. At the time, both French and Germans thought the occupation would be a provisional state of affairs and last only until Britain came to terms, which was believed to be imminent. For instance, none of the French delegation objected to the stipulation that French soldiers would remain prisoners of war until the cessation of all hostilities. Nearly one million Frenchmen were thus forced to spend the next five years in prisoner of war camps (about a third of the initial 1.5 million prisoners taken were released or exchanged as part of the Service du Travail Obligatoire forced labour programme by the Germans, before the war ended). The armistice did have some relative advantages for the French, compared to worse possible outcomes, such as keeping the colonial empire and the fleet, and, by avoiding full occupation and disarmament, the remaining French rump state in the unoccupied zone could enforce a certain 'de facto' independence and neutrality vis-à-vis the Axis. The Alsace-Lorraine Monument (depicting a German Eagle impaled by a sword) was also destroyed and all evidence of the site was obliterated, with the notable exception of the statue of Marshal Foch: Hitler intentionally ordered it to be left intact, so that it would be honoring only a wasteland. 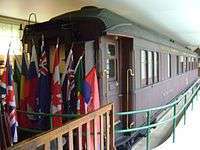 The railway carriage itself was later exhibited in Berlin, and then taken to Crawinkel in Thuringia in 1945, where it was destroyed by SS troops and the remains buried. The site and memorials were restored by German POW labour, after the war. 1 2 Maury, Jean-Pierre. ""Convention d'armistice" – Text of the armistice signed in Rethondes on 22 June 1940". mjp.univ-perp.fr. University of Perpignan. Retrieved 11 June 2015. .
↑ "The Varian Fry Foundation Project/IRC". Retrieved 7 December 2013. ↑ Lehrer, Steven. "Compiègne". Retrieved 7 December 2013.